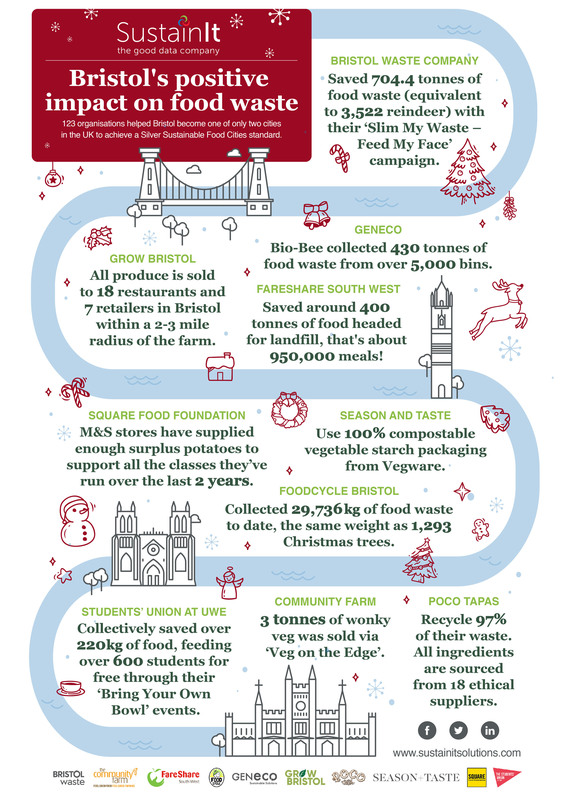 Callum Rees, from SustainIt, tells us more about their festive celebration of Bristol’s positive impact on food waste. 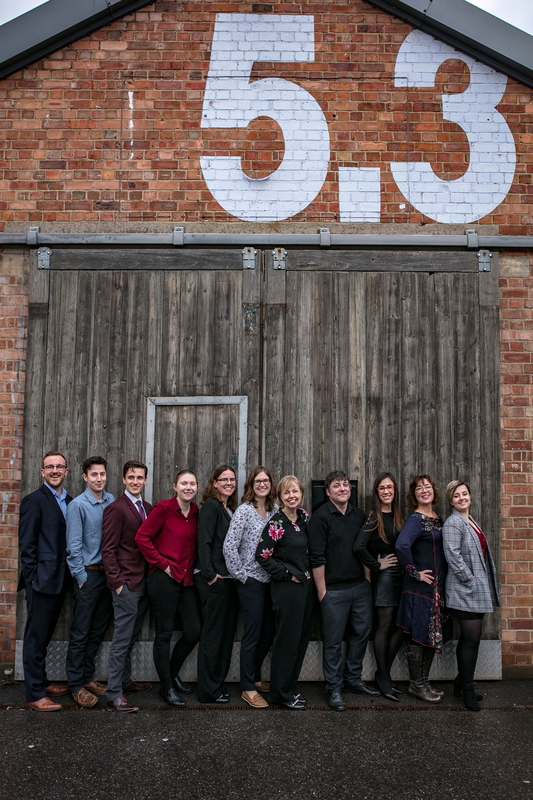 SustainIt are a sustainability consultancy based in Paintworks (Bristol) who joined the Partnership in 2013. It was founded by Charlie in 2006 and based on the idea that someone needed to help companies make a difference and improve their sustainability initiatives to create a better world for younger generations to come. The company has held strong values since from the beginning, including supporting women in business. 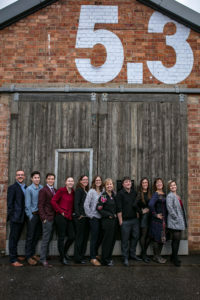 Being a predominantly family driven business, we feel passionately about engaging and educating people about the positive and sustainable initiatives and projects, people and organisations are doing around the world. The team came up with the idea that this year, instead of sending Christmas cards, we could speak with the Bristol community and create an infographic themed around food and beverage waste in order to put a spotlight on what local organisations are doing to combat global issues. We were particularly inspired by the Sustainable Development Goals. Since the inception of the UN SDGs in 2016, companies and governments have been working together tirelessly to enable positive change at a local level to address global challenges, and small-to-medium sized businesses are no different. Throughout the research process we asked the local business community to offer up any facts or figures they had around their positive initiatives, or about changes they had put in place to combat or educate others on the growing global issue of food waste. For example, we spoke to the Student’s Union at UWE who have been focusing on educating their students about food waste and the events they have put on over the year such as ‘Bring Your Own Bowl’ which used surplus food to feed over 600 students. We also spoke to The Community Farm based just outside the Chew Valley who grow and produce their own veg boxes, which they are now selling completely plastic free! We feel it is so important to engage with others and encourage them to make even the smallest changes at home and at work, and right now we’re hoping to use our knowledge of sustainability data to create as much positive conversation as possible around existing habits and how even small changes can have big impacts on our planet and people. In the New Year we are looking to support businesses in promoting and educating others all about sustainability and what that means for both organisations and individuals in Bristol. This will not just be limited to the food and drink sector. We are currently looking for companies to work with that would like to get involved in; discussion-based Podcast panels, more infographics like this one, creative reports and much more.